Vancouver, BC. ... Corvus Gold Inc. ("Corvus" or the "Company") - (TSX: KOR, OTCQX: CORVF) is pleased to announce the final drill and additional surface results from the summer exploration program at the Golden Range target area on its large Chisna Project located in south-central Alaska. The Company has been informed by its joint venture partner, Ocean Park Ventures Corp. (“Ocean Park”) that all the assay results have now been received from the remaining ten drill holes, two surface trenches and a number of soil and rock samples. Highlights include the discovery of a new high-grade poly metallic target in the Jolly Green area, with grades up to 126.5 g/t gold, 198 g/t silver and 17.7% copper, Corazon Target trench CZ-TR-01, which encountered 7.5 meters with 3.3 g/t gold and 4.6 g/t silver, and Matador target drill hole GR-11-08, which encountered 2.7 meters grading 681 g/t silver (Figure 1). Soil sampling and rock chip sampling have confirmed the distribution of significant gold and silver mineralization over an area of approximately 38 square kilometres. 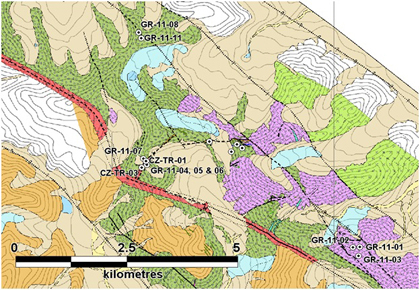 Figure 1: Geological map of the Central Golden Range Target Area showing major prospects and gold in surface rock samples. Jeff Pontius, Corvus CEO, stated: "The 2011 exploration results from the Golden Range Target Area have highlighted a new and significant District scale gold discovery with numerous high-grade gold and silver targets which have returned encouraging results. In addition, the continuity and intensity of the surface soil and rock mineralization at Golden Range is very encouraging for the presence of a major precious metal deposit. The continued porphyry association for mineralization in the belt, such as the recent Jolly Green discovery, continues to offer significant potential for new copper gold discoveries as well. We at Corvus look forward to our partner's further work on this exciting new Alaskan gold discovery." The 2011 Golden Range exploration program conducted extensive surface sampling, collecting a total of 1,785 rock samples. Of these, 19% exceeded 1 g/t gold, 5% exceeded 10 g/t gold, and 1% exceeded 50 g/t gold. Rock and soil sampling at Golden Range has now confirmed a 12 kilometre long trend of significant gold and silver mineralization outlining a new District scale gold discovery. The Jolly Green target emerged late in the 2011 season as having a base metal association with a strong gold, silver and copper association (Table 1). Out of a total of 29 rock samples collected at Jolly Green, 55% returned values over 1 g/t gold and 24% returned values of over 10 g/t gold, with 90% of the rock samples returning greater than 0.1% copper and 10% returning greater than 1% copper. The shear and vein hosted gold, silver, and copper mineralization at Jolly Green is accompanied by widespread copper staining in the surrounding quartz-diorite and may be associated with a copper-gold porphyry system at depth. Jolly Green is another priority target for future exploration. Table 1: Significant rock sample assay results from Jolly Green prospect. Corazon: Two trenches at the Corazon target exposed a shear zone yielding 7.5 meters averaging 3.26g/t gold and 8 meters of 0.5g/t gold respectively. Drilling attempts at the mineralized shear failed to hit the target due to poor drilling conditions but did intersect significant gold mineralization in the surrounding alteration zone (Table 2). City: Three holes were drilled at the City target to evaluate well mineralized, SW dipping fault structures observed at the surface. The holes encountered many zones of lower grade gold highlighted by hole GR-11-01 which returned two 0.7 meter intervals with 3.6g/t gold and 3.9g/t silver and 6.2g/t gold and 6.7g/t silver respectively (Table 3). Matador: Two holes were drilled at the Matador target at a shear zone target that has returned high-grade gold and silver results. Poor drilling conditions core prevented adequately testing of the target but one hole did return high-grade silver results (GR-11-08 with 2.7 meters of 681g/t silver). This new discovery of high-grade silver will be a priority target for future exploration. 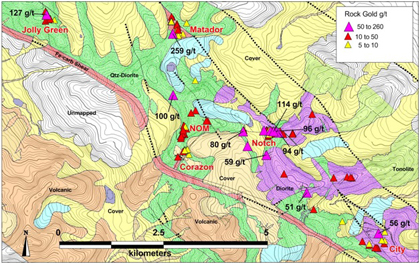 Figure 2: Geological map of central Golden Range showing the locations of hole collars at Corazon, Matador and City reported in this press release. Table 2: Significant Intercepts* from Trenching/Drilling at the Corazon target. *Intercepts calculated using a cut off of 0.1g/t gold with a maximum of 3 metres of internal waste. These intercepts are not true widths. At this time, there is insufficient data with respect to the shape of the mineralization to calculate its true orientation in space. Table 3: Significant Intercepts* from Drilling at the City and Matador targets. The Chisna Project is focused on a new and emerging Alaskan gold and copper-gold porphyry belt of deposits with copper and gold mineralization associated with mid-Cretaceous intrusions of similar age to the Pebble deposit to the west and Orange Hill deposit to the east. At present, the Chisna project controls approximately 232,000 acres of State of Alaska Mining Claims and land leased from Ahtna Corporation. The Chisna property has good infrastructure as it sits between two major highways, access to grid power as well as an extensive winter road network making this a unique development setting in Alaska. Corvus and its predecessor-in-title, International Tower Hill Mines Ltd., began exploration on the project in 2006 and discovered the Grubstake porphyry copper system in 2007. Beginning in 2010, the Chisna project is being operated as a joint venture between Raven Gold Alaska Inc. (a subsidiary of Corvus) and Ocean Park Alaska Corp. (a subsidiary of Ocean Park), with Ocean Park earning 51% by contributing US$20 million in exploration expenditures over a 5 year period, thereby providing Corvus with a no-cost assessment of this belt. Ocean Park may earn an additional 19% by producing a bankable feasibility that delineates a mining project on the Chisna property that produces at least 300,000 gold equivalent ounces per year. As of the period ending June 30, 2011 Ocean Park financials indicate a total of $6,717,135 of work has been completed at the project. Much of the work commitment includes a large airborne geophysics survey (6700 line kilometres of ZTEM (Z Axis Tipper Electromagnetic system), an innovative airborne EM system credited with correctly delineating the Pebble deposit) and extensive ground geophysics (100 line kilometres of 3D induced polarization) which helped outline a number of prospective copper-gold porphyry targets, many of which have yet to be drilled. All of the foregoing information has been provided by Ocean Park, which is the operator of the joint venture on the Chisna Project. Russell Myers (CPG 11433), a qualified person as defined by National Instrument 43-101, has reviewed and independently verified, the Ocean Park information that forms the basis for this news release and has approved the disclosure herein. Mr. Myers is not independent of the Company, as he is the President and holds common shares and incentive stock options in Corvus. This press release contains forward-looking statements and forward-looking information (collectively, "forward-looking statements") within the meaning of applicable Canadian and US securities legislation. All statements, other than statements of historical fact, included herein including, without limitation, statements regarding the anticipated content, commencement and cost of exploration programs, anticipated exploration program results, the discovery and delineation of mineral deposits/resources/reserves, business and financing plans and business trends, are forward-looking statements. Although the Company believes that such statements are reasonable, it can give no assurance that such expectations will prove to be correct. In addition, information with respect to the proposed activities of Ocean Park on the Chisna property has been provided by Ocean Park (the operator of the Chisna joint venture) and, as such activities are not within the control of the Company, the Company takes no responsibility for the accuracy of such statements. Forward-looking statements are typically identified by words such as: believe, expect, anticipate, intend, estimate, postulate and similar expressions, or are those, which, by their nature, refer to future events. The Company cautions investors that any forward-looking statements by the Company or any of its joint venture partners are not guarantees of future results or performance, and that actual results may differ materially from those in forward looking statements as a result of various factors, including, but not limited to, variations in the nature, quality and quantity of any mineral deposits that may be located, variations in the market price of any mineral products the Company or its joint venture partners may produce or plan to produce, the inability of the Company or any of its joint venture partners to obtain any necessary permits, consents or authorizations required for its or their activities, the inability of the Company or any of its joint venture partners to produce minerals from their properties successfully or profitably, to continue its projected growth, to raise the necessary capital or to be fully able to implement their respective business strategies, and other risks and uncertainties disclosed in the Company’s latest interim Management Discussion and Analysis and filed with certain securities commissions in Canada. All of the Company’s Canadian public disclosure filings may be accessed via www.sedar.com and readers are urged to review these materials, including the technical reports filed with respect to the Company’s mineral properties. This news release contains information with respect to adjacent or similar mineral properties in respect of which the Company has no interest or rights to explore or mine. The Company advises US investors that the mining guidelines of the US Securities and Exchange Commission (the "SEC") set forth in the SEC’s Industry Guide 7 ("SEC Industry Guide 7") strictly prohibit information of this type in documents filed with the SEC. Readers are cautioned that the Company has no interest in or right to acquire any interest in any such properties, and that mineral deposits on adjacent or similar properties are not indicative of mineral deposits on the Company’s properties.